Because, if not, I can remedy the situation! Once upon a time, I wrote a series I called the Farm Fresh Romance series. It contains six novels, all set on one farm in northern Idaho. There were a couple of sets of siblings in the mix, but the focus was on friendships on the farm as they built a sustainable local food business together. Then I added a short story called Peppermint Kisses. I left it tiny in the image because it’s not for sale anywhere. For several years, it was what we call in the biz a “reader magnet.” That is, it was (still is) a thank-you gift for subscribing to my email list. It was reasonably successful at turning casual readers into subscribers and hence into fans, and I got quite a few emails asking me what happened next to Rebekah and Wade. I hadn’t intended to write more about them, figuring the short story, which ended with a happy-for-now rather than a happily-ever-after, was conclusion enough. After all, the entire short story took place over several days between two college students. Undying forever love seemed a bit of a stretch at the end of it! Hey, I thought, when I began working on a spin-off series, the Urban Farm Fresh Romances, why don’t I have Rebekah and Wade already happily married and expecting their first child? They can be part of the Bridgeview community. Not everyone can be twenty-something and searching for their soulmate, after all. Clever, right? To pull readers from the Farm Fresh series to the Urban series, I made the younger brother of two heroines (Sierra from Sweetened with Honey and Chelsea from Plum Upside Down) the hero of the first book, Secrets of Sunbeams. Jacob had been in and out of the FFR books as a college student. This meant I needed to figure out the UFFR timeline in relation to the FFR timeline. Easy peasy. Except the emails about Rebekah and Wade continued. So when I decided to write a prequel to the UFFR series to act as an updated reader magnet, I had to figure out how to break them apart and put them back together in Promise of Peppermint. The timeline gave me five and a half years. Plenty of time for them to grow apart and grow up. 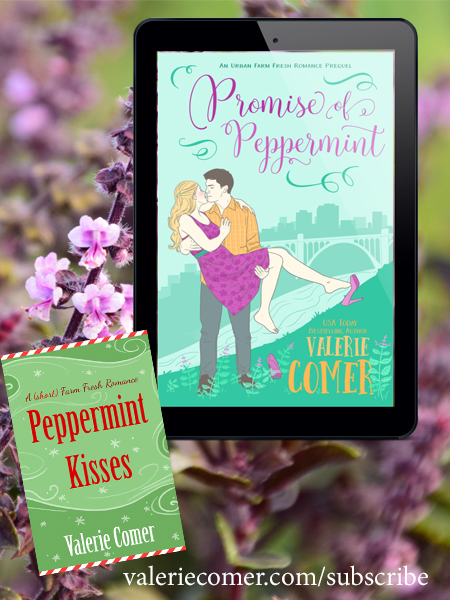 You can get both Peppermint Kisses and Promise of Peppermint by subscribing to my email list. Characters from the UFFR series visited Green Acres Farm, the FFR setting. Who had kids by now? How old were they? What was new at the farm? Then I continued with the Christmas in Montana series. Book one, More Than a Tiara, was already released. I knew the heroine of book two, Other Than a Halo, would be Bren, a secondary character from Tiara, but who was the hero? Brilliant idea!!! I’d make him Rob Santoro of the Bridgeview clan in UFFR. But when Bren and Rob went to Bridgeview for Thanksgiving, I had to figure out when in the UFFR timeline this visit fit. I had to up my game. My spreadsheet, which had started with a totally arbitrary year of 2011 for Raspberries and Vinegar, now included all the FFR books, the UFFR books to date, and now needed the Christmas in Montana books slotted in. When were all these people born? When were their weddings? How about babies? Who was the same age as whom? What about other significant events? The Garden Grown Romances came next, part of the Arcadia Valley multi-author series. Turned out the heroine of Rooted in Love was the sister of Adriana, the heroine of the UFFR title Memories of Mist. And then it turned out that, in the final story, Harvest of Love, the hero’s roommate was Tony Santoro, who was a teenager back in book two of the FFR series, and who will get his own story upcoming in the UFFR series. Tony’s a chef… so is Levi from the third Christmas in Montana… I bet they went to school together! Meanwhile a tertiary character (Cheri) from the GGR series became the first heroine in the Montana Ranches series. 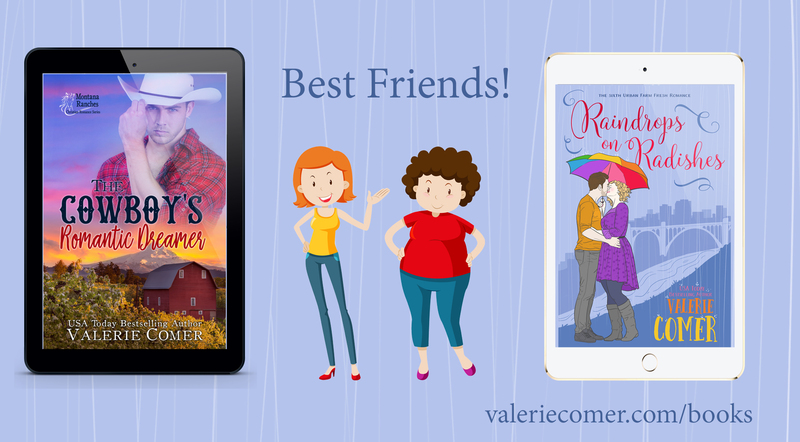 And her friend Denae (heroine of the third cowboy book, The Cowboy’s Romantic Dreamer, now on pre-order) turned out to be the best friend of Sadie, in the UFFR book Raindrops on Radishes. That criss-cross is actually what inspired this post! So, if you’re confused, join the party. 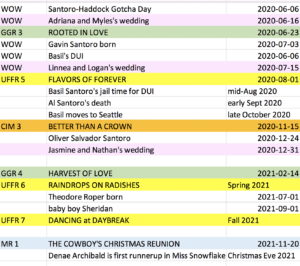 Because my spreadsheet is 280 rows long, extends several years into the “future,” and is color-coded by series and event. It’s probably missing some vital stats since I’m not even counting character names or family trees or all the info I’ve got stored in other spreadsheets per series. For someone who hates spreadsheets — they call those little boxes cells for a reason — I sure have a lot of them. Rather than make this post even longer (gulp), if you truly want to see and understand each connection, I’ve posted it on my own website, all broken down into bite-size chunks at A Friend of a Friend of a Friend. Does this mean you need to read all my books to get the full experience? Nope. I added all the connections more for fun and to provide a richer experience. You probably will want to read by complete series, though some titles stand alone better than others. Comment for a chance to win your choice of any one of my books (e-book only, worldwide, not including series bundles). Maybe you simply need to get started somewhere! Comment before Friday, March 22. One winner will be announced in the Sunday Edition. The only authors I have had time more than one series together that I read were very clearly tied together and did not seem anywhere near as complicated as yours seem. Honestly I am not sure how I would feel with it so confusing. “Do you like it when authors link their series together?” Y.E.S. I Do! I do enjoy it when characters cross books and series. I love the “aha” moment when I make the connection. That’s the fun for me, too. Why invent a new character when one from a previous story can easily pass through this one? Hi Valerie, I LOVE it when I read books and there is a connection. I actually like it when it is a surprise- it is like meeting an old friend:) It actually makes a series feel more real to life in some ways- haven’t we all met someone who knows someone we are connected to…?! I have never thought of how complicated it would be keeping track of everything- somehow as I read, I have never thought through the logistics, so thanks for sharing. Hi Valerie! Having read most of your series, I am amazed how the various series interconnect. Since I first started reading your Farm Fresh series in 2014, I have read at least 500 books (about 100 books a year) by a variety of authors in a variety of genres, so at this point in my reading I prefer stand alone series or books. Sorry Valerie! My old brain has lost some of its power of concentration and I enjoy variety in my reading – contemporary and historical romance, cozy mysteries, and non fiction. Enjoy your week. Hope spring arrives soon in your neck of the woods. Best wishes. You have read a lot of books, Renate! Wowza! I do try to make it so readers don’t have to know or remember the other character for the story to make sense. It can just be a regular secondary or tertiary character and not be noticed. That’s fine too. Spring has arrived! Or at least Mud Season has. I’m going to be honest here and say, no, I don’t like it when authors like their series together like you have done. For someone with an OCD personality like I have, this type of linking poses a major problem! For me, it means that I absolutely HAVE to read every single book, in order, before I get into any new releases that come out, because often times the author can’t resist mentioning those links and ties to the previous books in the newest release. Unfortunately, my neurosis won’t let me do anything BUT read the universe in order, because it bugs me that I don’t have the “whole” story. Since I try to break up my monthly reading by going for a few different romantic sub-genres during the month, it means that it could take me up to a year or more to get to a book releasing in say April of 2019, and more releases could pile on top of that one! Kristen Ashley is another author that has done similar linking between her series. The ones I know are linked together are her Rock Chick, Dream Man, and Unfinished Heroes series, but I believe that there’s a series out there about her Nightingale Security team, and that would be linked in as well. After discovering her linking the hard way, I’ve tended to shy away from her newer releases. All that being said, I have to admit, I like the fact that you’ve done this post! It lets me know what I’d be getting into if I start the books of yours that I’ve purchased! Well, here’s the thing. It’s pretty rare that knowing the other character previously makes a difference to how the reader perceives him or her. For instance, Brent Callahan is the hero of Dandelions for Dinner, the fourth Farm Fresh Romance. In that story, he’s a timber-frame building contractor working for his uncle in northern Idaho. So when a ranch family in my Montana Ranches series decided to build a house, it seemed like they might hire Brent. In the cowboy story, it makes no difference who the contractor is. He’s mentioned in passing a couple of times. It’s just a wink and a nod for the readers who remember him that he’s still alive and kicking. That said, I get what you’re saying, too! I absolutely adore the cross iver in your books and seeing old friends again! What needs to be made clear to this that may not have read all your books yet is that they are still fine as stand alones! We fans that have read the previous books are rewarded with catching up on the others, but they are not required to enjoy the story in it’s own! Yes, I may not have made that clear enough LOL. The stories can be read as standalones, too. I like when characters cross between series! I love when authors build communities through their stories Valerie! I do tend to like to read them in order when possible though. I see so many of yours that connect I wasn’t sure where to start so this post is very helpful. Even though you have those 280 rows, lol, I think it has to be easier to write those characters you already know then starting a series from scratch. Gracious. I’ve read a majority of your books and knew they were connected, but not how tightly. 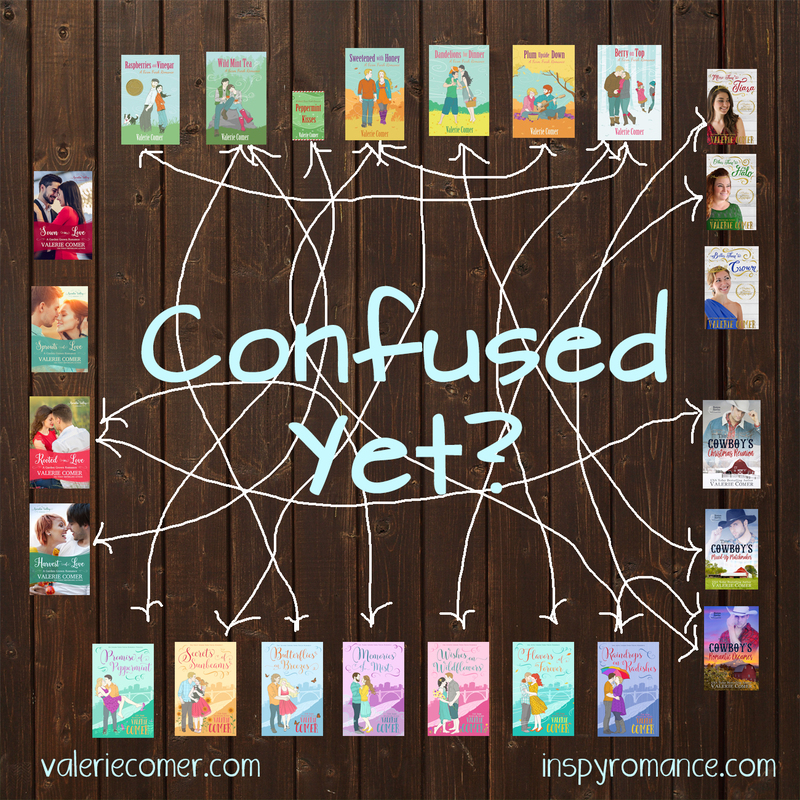 I think I’d be too confused to keep up with all of that (as a writer). On the other hand, it’s hard to keep up with so many connections, as a reader, between who’s related to whom and how. It can get very confusing, making it hard to concentrate on the story. I guess I prefer a small connection between series, if any at all, rather than a lot of them. Thank you for your break down sheet. I have read it both ways and depending on the author and the story line, I like both ways. You’re welcome :) And thanks for being a reader! Connecting stories are great. I do love making those connections as a reader. :) You’ve done a great job, and yes, as a girl who avoids excel worksheets, they are so helpful and we can’t help but love them when they work for our good. I like the connections in stories. Makes me feel like I am keeping up with old friends. I like connecting stories because you have another story to look forward to. That’s a great way to look at it :) Thanks. I love when series are interconnected! Sometimes I may forget where I’ve seen a name before, but I do enjoy seeing them again. Almost always I read all of an author’s books and I like finding that character(s) in their new books and get to catch up on their lives. There are rare occasions if the author writes a book or series that is totally different and I’m not interested in reading it (such as an author who has written totally about cowboys for years but early in her career wrote a foreign suspense series and included that character in her recent book) that I regret it because I want to know who everybody is and how they fit into each other’s lives. I like what you said about including a note about the characters at the end. That’s a great idea! I can see it would be tricky if the series crossed genres! Love when the stories connect Thank you Valerie for this wonderful information! LOL, oh my, that is some web of connections! Mine are the same, though there are some subtle links between series I haven’t developed yet. I can’t wait to see yours develop too! Valerie, my eyes are bugging out! How did you figure all this out and stay sane? Sanity… hey, I don’t think I claimed any of that nonsense, did I??? I love it when authors link their stories together. It’s like seeing old friends when they pop up in other books. Yay! I hope you enjoy my series connections. I’m having too much fun to stop! I love having characters who link between books and series! If that link is important to the story then I think the books should be close together so I can remember clearly who each character is. If the connection isn’t important to the plot and is more for fun then it doesn’t bother me to have them all over the place. I really enjoy all your books! Thanks, Melynda! Most of the connections aren’t vital. I do think Sadie’s story (Raindrops on Radishes) and Denae’s (The Cowboy’s Romantic Dreamer) are very complementary, though, and releasing about 8 weeks apart albeit in different series. Characters in books become “real” to me, so I love hearing more about them in other books. Wow, Valerie! I don’t know how you keep it all straight, even WITH a spreadsheet!! I love writers whose books connect! There is never enough about a certain character in just one book! Thankfully, I got started with your books at the very beginning, so I’ve been able to read them in order. I do appreciate it when authors do as you’ve done and have charts and spreadsheets helping me remember what the connections are. I still have a couple pages of notes somewhere of all the connections I discovered in D.E. Stevenson’s books years ago. I love series but, goodness, your series(s) sound confusing! lol One of these days, when I have more free-to-read-what-I-want reading time, I’ll start checking into yours. I just joined your email list today! Thank you for joining in! It really isn’t as confusing as it sounds LOL. Pick a series that sounds fun and start at the beginning. Everything you REALLY need is within one series. The other connections are just for fun. You know my stories well enough to know they are not cliff-hangers!!! I do re-read (portions) but I do RE-listen (just made up that word….) So grateful for your audio books. I like it when they’re connected but not when it’s important to the plot that you know the connections. I try to read series in order but it’s not always convenient to do so. And even when I do, I quickly forget the characters and details from previous books. Having a bad memory is good in some ways especially for mysteries. I can’t remember who did it so I can re-read to my heart’s content! You made me smile with that last bit! Hi Valerie! I am currently reading Raindrops On Radishes. This is the first book that I have read written by you. I have really enjoyed the character Sadie and the plot. I will have to check out your other books. Ok, I got really confused! I’ve read most of the books, but I’m not that good at making all the links. It must be hard to tie all the knots. When I read a book I sometimes think the characters are like friends of mine (some close friends, some not that close) and I always like to see what happened to them in the future. So I guess the answer to your question is that I like when authors link their series together and I can know what happened to my “old friends”. Yes I do like authors who link their characters across their series. But I never considered how complicated it could be for the author to do this. You do a really good job at linking characters. I’ve been reading the multi author clean romance River’s End Ranch series lately. I really like that they do a “After HEA” for each author, part way through the series. It’s basically 1 Chapter featuring the Couple from their previous series books. So the After HEA book is maybe 30-40 pages total. I really wish you’d consider doing something like that for your series. It was sorta like that in “Raindrops on Radishes” when the heroine went to the FFR. It was really nice to be able to catch up with some of the FFR characters again! Oh, that’s a fun idea, Esther! I recently had to ask my street team if I’d mentioned that a previous heroine was pregnant /face palm/. I was able to work around it as most of them were sure I hadn’t, so the way the story worked, there wasn’t really a reason to mention if she was or not. Some stories intertwine more than others. Some are passing/glancing mentions that you may or may not catch. Some are much more in depth. My always-the-boyfriend-never-the-groom hero has shown up in many books since he got his HEA and readers love getting updates on their lives. But if you hadn’t read any of those early books, he’s just a guy who handles security for VIPs whose wife may (or may not) be pregnant (depending on which book). Plus he has kids. I need something like this. I have grand plans. I don’t follow through very well though :/. I need to get better at that. I may need to borrow your spreadsheet to get started ;).